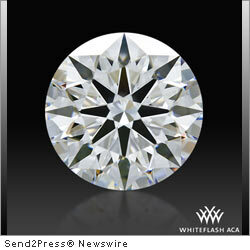 HOUSTON, Texas, Oct. 12, 2011 (SEND2PRESS NEWSWIRE) — Whiteflash Inc. announced today that a new collection grade diamond has just taken its place in the vaunted A CUT ABOVE® brand, adding even more muscle to its inventory of world class diamonds. Combining perfect cut quality and light performance with perfect color, this 2.26 carat D color VVS2 clarity Hearts and Arrows Ideal (priced at around $100,000) now takes its place among the finest diamonds in the world. An important diamond in its own right, the 2.26 joins a 2.10ct D IF and a 3.09ct G VS1 as elite members of the internationally recognized A CUT ABOVE® family of super ideal diamonds. Each diamond has been awarded an Ideal Platinum Certificate by the American Gem Society Laboratory, the most prestigious cut quality and light performance credential in the world. In addition, each gem has passed all of the additional evaluations required by the Whiteflash diamond review team for entry into their uncompromising brand of Hearts and Arrows diamonds. Cut and polished with advanced technology to excruciatingly exact specifications, the A CUT ABOVE Hearts and Arrows Super Ideal delivers the absolute maximum fire, brilliance and scintillation technically possible in a diamond. Comprehensive information is posted for each diamond to the Whiteflash.com website including gemological data and several different types of light performance imaging. Secure online purchasing is always available and Whiteflash also welcomes international visitors to their Houston offices. The award winning Whiteflash.com website, described by Kiplinger’s Magazine as the “Lord of the Online Rings” enables shoppers the world over to view, compare, and purchase top quality loose diamonds, engagement rings and fine diamond jewelry in a convenient and secure environment.